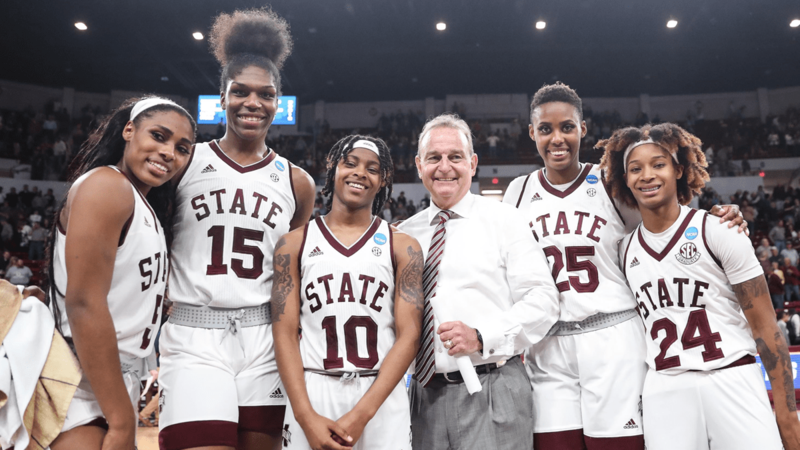 Mississippi State sent the winningest senior class in school history out with a resounding 85-61 victory against Clemson in the second round of the NCAA Tournament Sunday, March 24. Teaira McCowan shone in her final game in Humphrey Coliseum, becoming the first SEC player since the 2010 Elite Eight with 30 points and 10 or more rebounds in a Tournament game. The Brenham, Texas, native finished with 30 points, 11 rebounds and six blocks while breaking MSU’s Tournament record with 14 field goals made. “I couldn’t be prouder of my team. I thought defensively, the first half, that may be as good as we’ve been in a while. I am extremely proud of my team. You win a game in the NCAA Tournament like we did tonight, you know you are doing some things right,” said Vic Schaefer, head coach. Anriel Howard added 21 points and a game-high 14 rebounds for her 45th career double-double. State is 12-0 when the duo of Howard and McCowan record double-doubles in the same game. Jordan Danberry poured in 18 points with three assists and three steals in her final game in the Hump. State (32-2, 15-1 SEC) took control of the game early with a 12-4 run over 4:42 in the first quarter to build an 18-8 lead with 2:19 on the clock. The Dawgs scored 11 points off eight turnovers in the opening 10 minutes while holding Clemson (20-13, 9-7 ACC) to just 38.5 percent shooting (5-of-13). The teams traded baskets in the second quarter before MSU sparked a 9-0 run to close the half and take a 41-22 lead into the locker room. The Tigers fought back in the third, scoring eight unanswered points in just 14 seconds to trim State’s lead to 59-46 with 1:05 left in the quarter. State sunk three free throws to close the half, and the Bulldogs would never lead by less than 16 again. McCowan and fellow senior Jazzmun Holmes closed their Humphrey Coliseum careers in style, sparking a final 8-0 run in the closing moments of the game. McCowan added an emphatic block on the other end with 1:11 to play before she and the seniors exited the game to a standing ovation. Holmes and McCowan have now tied the school record for career games played (148) set by Morgan William and Victoria Vivians last year. The 2019 class has now won 131 games with just 17 losses in their four years and have made the Sweet Sixteen every season. MSU play No. 5-seed Arizona State Friday, March 29, in the Portland Regional at the Moda Center. Tipoff times and broadcast information will be released later this week.